The crowning addition of the Sports Yacht series the same slender athletic build is combined with modern refinements and a new Nuvolari-Lenard designed vertical bow that allows for even better sea keeping than her peers, with the bonus of riding dry. BLISS is without doubt the most luxurious of the Sport Yacht range emphasizing huge open spaces. A swimming beach steps up to the large, sheltered aft deck with comfortable seating and dining areas that flow into the main saloon and forward owner’s private study. The extensive main deck saloon is divided into living and dining areas by a low-profile stairwell. The exterior layout is designed across one level with walkways leading to a foredeck pool that area offers more lounging and a pool deep enough to really swim in with wide open views of the surrounding sea. The pool can accommodate a large tender while under way to be hoisted by the hidden fore crane; jet skis and equipment are located in two forewells and anchor handling and mooring are sheltered in the hydraulically controlled forepeak. BLISS can accommodate up to 10 guests in 5 luxurious ensuite staterooms. Forward, the tremendously spacious owner’s suite will stretch full beam with large circular windows letting in the natural light and sea-views. BLISS reflects the maturation of the entire Sports Line. 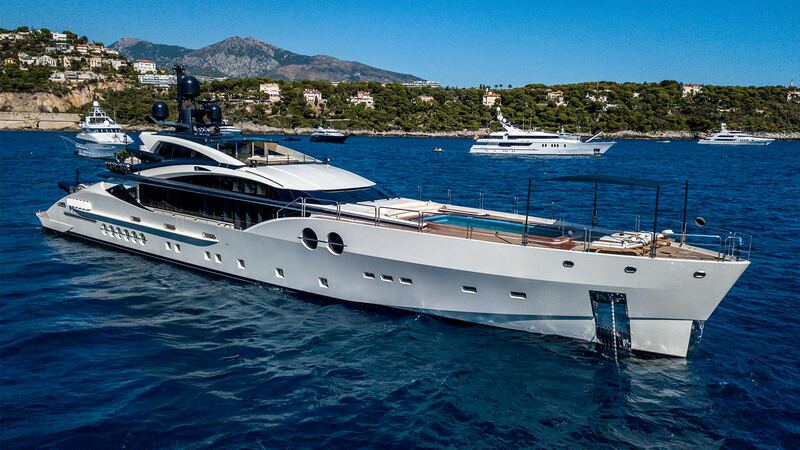 Moran Yacht & Ship negotiated the build contract for BLISS, wrote the technical specifications and managed the entire build process for the vessel. Our team was by the owner’s side from concept well through completion.